The long-established Bukit Tunku is perched on a hill, overlooking the city centre. 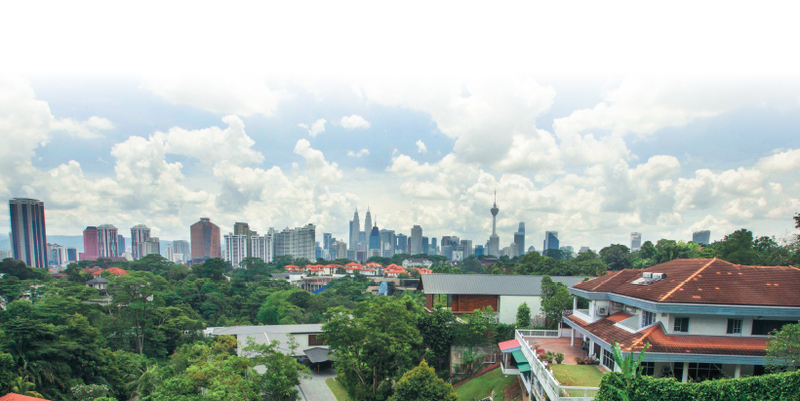 Surrounded by mature greenery and tree-lined roads, it is recognised as one of the prime residential areas of Kuala Lumpur. 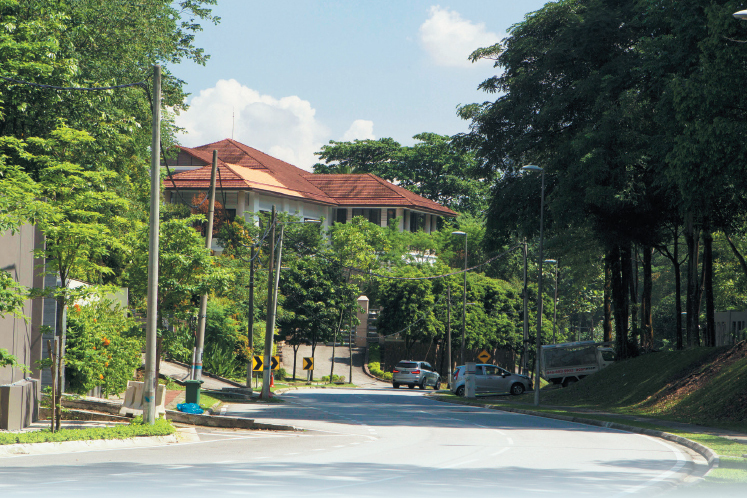 Located on the western fringes of the capital, Bukit Tunku boasts mainly luxury detached homes, mansions, vacant residential land and low-rise condominiums. Nearby landmarks include Duta Tennis Stadium and Sunway Putra Mall. Taman Botani Perdana as well as attractions such as the Kuala Lumpur Bird Park, Planetarium Negara and Carcosa Seri Negara are also a short distance away, consultants point out. Metro Rec Sdn Bhd managing director Ng Weng Yew concurs. “Bukit Tunku is often touted as the Beverly Hills of Malaysia and is a prestigious address for wealthy locals and expatriates. It comprises residential detached houses, vacant plots interspersed with low-rise strata condominiums boasting low density of 40 persons per acre, according to the Kuala Lumpur Structure Plan 2020. “As Bukit Tunku is sited right next to the central business district of Kuala Lumpur, divided by Jalan Kuching, it is close to all commercial and retail facilities of the city centre. To the southwest is another upmarket residential address, Taman Duta,” Ng says, commenting on Bukit Tunku’s excellent location. “Taman Duta comprises mostly leasehold land. Historically, Taman Duta has had many residents who are government servants [who were given some land as tokens of appreciation for their decades of service]. This was a common practice back then. 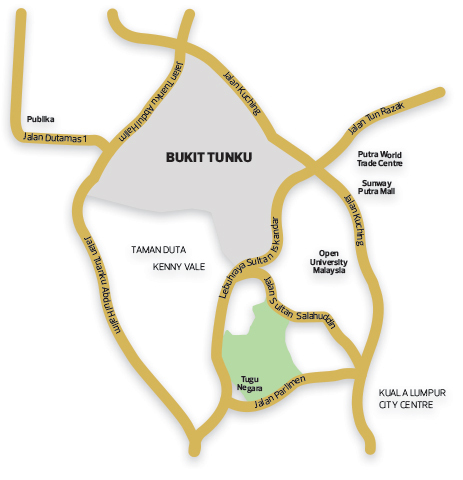 Meanwhile, Bukit Tunku is mainly made up of freehold private land,” says Toh. Although it does not have public transport, Bukit Tunku is still well connected and accessible via Lebuhraya Duta — Sungai Buloh, North-South Expressway and Lebuhraya Sultan Iskandar. The Putra Komuter Station is nearby. The neighbourhood is flanked by major roads such as Jalan Tuanku Abdul Halim, Jalan Segambut, Jalan Ipoh, Jalan Kuching, Jalan Tun Ismail and Jalan Perhentian. 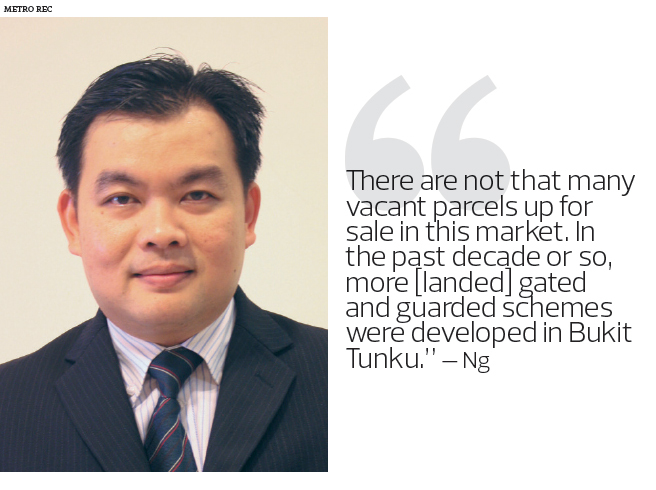 Despite the sluggish market sentiment, Bukit Tunku maintains its values, occupancy and overall demand. Apart from its lavish residential homes and vacant land, newer gated-and-guarded developments are built in the last few years. “There are not that many vacant parcels up for sale in this market. In the past decade or so, more [landed] gated and guarded schemes were developed in Bukit Tunku such as Impian Bukit Tunku by Bukit Tunku Elite Properties Sdn Bhd and Kenny Vale by Tan & Tan Developments. The take-up rates were generally good,” observes Metro Rec’s Ng. It appears that demand for residential landed properties here is steadier than that for non-landed properties, says LaurelCap’s Toh. “This could be attributed to the local council’s low-density development guidelines, so developers are forced to build large condominiums, which contributes to the final selling prices being out of the reach of many buyers. As such, the demand spills over to neighbouring areas such as Mont’Kiara, Sri Hartamas and Damansara Heights,” he says. For the residential segment, the average built-ups for landed properties range from 5,000 to 10,000 sq ft. According to Toh, the average prices of landed properties in Bukit Tunku are between RM350 and RM700 psf (depending on the terrain). Meanwhile, average rents are between RM2 psf and RM3.30 psf per month, with yields of 2% to 3%. As for non-landed properties, the average prices are from RM850 to RM1,100 psf. Average rents are from RM2.50 to RM3.50 psf per month, with yields of 3% to 4%, adds Toh. According to Toh, there are a couple of projects that are in the pipeline or waiting for approvals in Bukit Tunku. “According to Portal OSC, there are projects that are in the works in Bukit Tunku. There is a project comprising two blocks of apartment villas that date back to 2016, and another project comprising eight blocks (146 units) of residential villas that date back in 2017,” says Toh. Details are still scarce, he adds. In terms of the commercial segment, there is only one row of shoplots under Taman Tunku Apartments off Langgak Tunku by Selangor Properties Bhd. The leafy thoroughfare is frequented by residents in the area. “CIMB Bank, Kenny Hills Bakery and Kenny Hills Bistro are located there. I believe the properties there are not for sale but for rent only,” says Toh. “Average rents [for commercial properties] are between RM3 and RM5 psf per month. “The area attracts mainly owner-occupiers, some with large wealthy families [of many generations]. Most of the parents living in Bukit Tunku [for decades] buy properties for their children in the area as well. Alternatively, some of these families opt to have a few generations stay in one large mansion [but designed with different accesses] to maintain their privacy,” says Toh. Bukit Tunku also has an active residents’ association that organises community events and monitors the safety of the area. Nearby amenities include Damai Service Hospital, Sentosa Medical Centre and Kuala Lumpur Sports Medicine Centre. Academic institutions are Open University Malaysia, Universiti Tun Abdul Razak and SM Sains Seri Puteri. Toh agrees. “The traffic congestion is [mainly] along Jalan Duta and Jalan Kuching. “The outlook for Bukit Tunku is still bright. Property values are still on an upward trend, but the pace is slower,” concludes Toh.